New York, NY (June 12, 2012) – Whether you are visiting, working, or living in Lower Manhattan, now you can recycle in style. Starting this week, a new high-tech recycling bin is being be piloted at Whitehall Plaza on Water and Whitehall streets. The Renew Recycling Bin, which doubles as a communication pod and recycling point, receives recyclable paper and magazines in a safe and beautifully designed facility that is manufactured, installed and operated at no cost to the city. A complete network of these pods can be found in the City of London, where Media Metrica Ltd., Renew’s creator, was awarded a 21-year contract to tackle the problem of public space recycling. The sleek recycling pods broadcast live, dynamic information ranging from weather reports to stock market results on street-facing, high-definition, LCD screens. The pods also provide City Officials with additional channels of communication for traffic, transit, weather, and safety alerts. New York’s pilot pod has fixed screens with a local way finding map or iconic Lower Manhattan imagery. 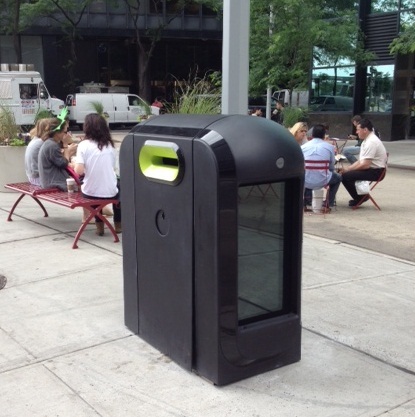 “A 21st century, global business district, it is only fitting that Lower Manhattan is now home to the first 21st century recycling bin in the United States,” said Joseph Timpone, Senior Vice President of Operations for the Alliance for Downtown New York. In January 2012, Renew, the first of a new generation of “on-the-go” media, started broadcasting on the streets in the financial heart of London, bringing together the best of broadcast, out-of-home, online and wireless communication. Through a 20-year contract with the City of London, news is broadcast via an initial 50 Renew screens rising to 200 screens in time for the London Olympics. The screens, housed in the City’s novel recycling points, relay visual information tailored for the needs of over half a million professionals who commute into the City of London every working day. Learn more at www.renewsolution.com.